Email has become a vital form of communication in business, educational, and personal correspondence, which makes it the perfect target for attacks on your confidential data, files, and assets. The majority of data breaches and attacks utilize email to deliver spam, viruses, malware, ransomware, and other sophisticated targeted threats. With ACE’s new Platinum Email Service, you can prevent email attacks before they reach your inbox. Initial assessments by ACE, after deployment of the Platinum Email Service, indicate approximately 90% increased filtering of spam, malware, and viruses, including ransomware. 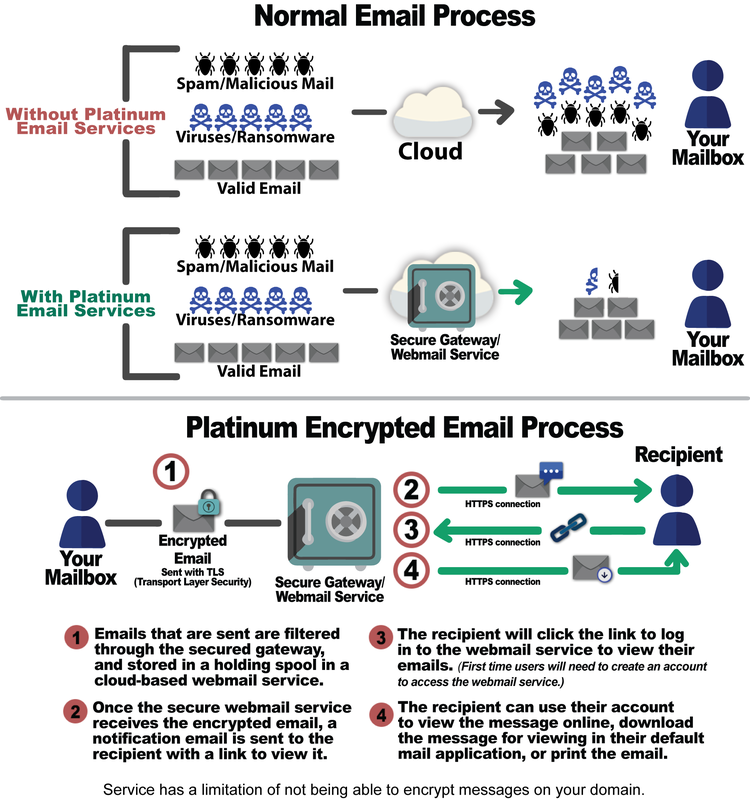 If your organization deals with sensitive information such as payment information, social security numbers, HIPAA data, needs a secure connection to send confidential interoffice files, or just want to protect yourself from the consequences of potential email threats, our Platinum Email Service is right for you. Increased protection from spam, phishing, and malicious links. Increased protection from Denial of Service attacks, malware, and viruses including ransomware. Increased prevention of data loss or theft with email encryption. No email security solution is 100% effective in blocking all threats. Our Platinum Level Email Service only decreases your chances for attack as the first component of a two-part defense solution. The second component in a complete defense solution is a good backup solution. ACE offers a comprehensive data backup solution with Data Backup Suite (DBS). Contact ACE for more information or a quote by email at sales@aceks.com.